Use Bump & Blemish on the face, neck, bikini area, legs, underarms. When should I use BUMP & BLEMISH® ? 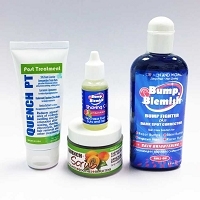 Use BUMP & BLEMISH® regularly after hair removal (shaving, waxing, sugaring, tweezing, electrolysis, laser hair removal). For prevention of complications, use once daily immediately after hair removal. To resolve problems, add a second application at night. It has exfoliating, soothing and skin brightening actions combined to help improve the appearance of razor burn, razor bumps and ingrown hairs, as well as their associated dark spots. 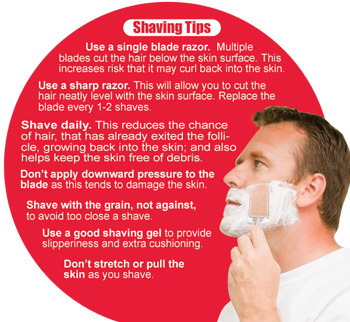 In addition to using our product, if you shave, check out our shaving tips (this page, right insert). Proper shaving technique helps minimize complications. If you use waxing or sugaring for depilation, check out our waxing tips. Read the instructions completely before using. Apply directly (or with the help of a cotton ball) to dry skin after hair removal. Or, if you are using the roll-on bottle, slide over the skin and target the most recalcitrant spots. Only a thin coat is needed. A little product goes a long way. For example, on average the 2 fl. oz (60 ml) bottle provides 3-4 months of twice daily facial applications and the 4 fl. oz (120 ml) bottle provides 6-8 months of twice daily facial applications. Shaving tips to avoid razor bumps. As with any new product that you apply to your skin, it is recommended that you apply it to a small, inconspicuous area the first time. Men’s problem areas are frequently the beard, neck, chest and back. In women, the areas most frequently affected are the bikini area, underarms and legs. Use once daily, preferably immediately after hair removal, to help reduce the immediate appearance of redness, and also to minimize the “bumping” of the skin the next day. Use warm water and a good shaving gel or cream (those contain hair softening ingredients) and let the hair swell and soften before shaving. Multiple-blade razors cut the hair below the skin surface- as their commercials proudly show. This increases the risk that the hair may curl and grow back into the skin. A sharp razor will allow you to cut the hair neatly level with the skin surface. Replace the blade every 1-2 shaves. Shaving daily reduces the chance that hair that has already grown and exited the follicle will grow back into the skin creating an external bump. Shaving daily helps keep the skin exfoliated and allow the new hair to grow easily out of the skin. As long as you do it right, it is no problem to shave daily, quite the contrary. Applying pressure as you shave, tends to damage the skin, and you also increase the risk of cutting the hair too short, below the skin surface. Shaving first in the same direction that the hair grows, "with the grain", insures that you won't shave too close. If needed, apply a second layer of shaving gel, and shave across the grain. In addition to hair-softening ingredients, good shaving gels or creams provide slipperiness and extra cushioning, so you can easily glide the blade without damaging the skin. Lather is optional, many people like to have abundant lather from their shaving products, and that is OK, but is not necessary for a good shave. Stretching or pulling the skin may give you too close a shave, or damage the skin. Repeat the application at night, if you are already suffering from razor bumps or ingrown hairs. The appearance of the bumps should improve noticeable in a few days. With time and regular use, the skin will be smooth and even toned. Use the roll-on 12 ml bottle to target problem areas more frequently. Flammable. Not for ingestion. KEEP OUT OF THE REACH OF CHILDREN. KEEP AWAY FROM EYES. Do not use if you are allergic to salicylates or aspirin, or any of the other ingredients of the product. May damage leather, fabrics and other surfaces. Avoid use in combination with retinoids, acid peels or other exfoliants. Always use sunscreen when using this or any other exfoliant product. Unlike other razor bump products, BUMP & BLEMISH® does not sting upon application. Some users report mild tingling but not uncomfortable. BUMP & BLEMISH® promotes exfoliation of the skin, which may appear as a light “peeling”, this is normal. The use of a moisturizer such as QUENCH PT® after BUMP & BLEMISH® has been absorbed by the skin, is a perfect combination. 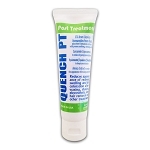 QUENCH PT® is an all natural, non-oily balm with twelve soothing ingredients of botanical origin, plus curcumin liposomes to brighten the skin and even the skin tone. In addition it contains hyaluronic acid, shea butter, vegetable squalane and borage oil to leave the skin soothed and deeply moisturized.